Oak barrels have been in used in the wine aging process for thousands of years, dating back to the Roman empire. Oak barrels have the ability to impart oak 'flavor' to wine which can be described as leather, vanilla, clove, spice, leather, toast, liqurice and smoke. Small amounts of oxygen also transfer though the staves of a barrel which allows the wine to mature more quickly than if the wine was aged in Glass or Stainless Steel. Wine barrels also will evaporate alcohol and water. This helps to concentrate the body, aroma and flavor of wine. The best tasting red wines in the world are usually aged in oak barrels. We recommend using the same size barrel as the batch size you are making as barrels should always be kept full and stoppered with a solid bung. Hungarian oak is fairly dense wood and the flavors tend to be extracted more slowly compared to American oak barrels. This allows the winemaker to keep the wine in the barrel longer resulting in a more concentrated wine. 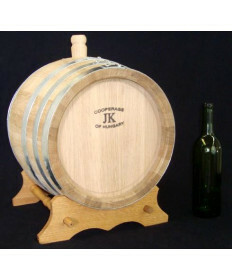 Contact Us if you have questions about any of our Hungarian Oak Wine Barrels.